This was in the days before the women’s movement had taken hold, but my sensitivities to my second-class status were already on the alert. The society at Oak Ridge reflected life in America at that time: It was segregated: black women like Kattie Strickland lived in quarters segregated from whites, left their children behind in Alabama to be raised by their grandmothers, and held menial jobs. It was social: the community provided an active social life with dances, bowling alleys, movies, and clubs. Some, like secretary Celia Szapka, leak pipe inspector Colleen Rosen, and statistician extraordinaire Jane Greer, met the men they would marry. The society was also different from the rest of America: Women slogged through mud to get to work, often carrying their shoes until they reached their workplace. They lived in a secret society, unable to speak about their work, even to others on “The Reservation.” Many of the women had jobs they would not have been offered on the outside, like Virginia Spivey, a chemist who analyzed “The Product,” guessing its content, but not its potential use. 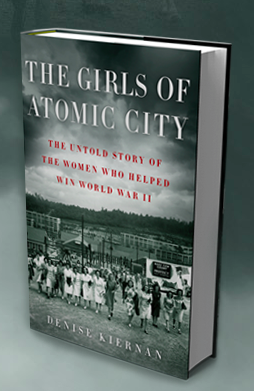 Like all those working at Oak Ridge, her position was so compartmentalized that she (and all the other women and men) did not know what “The Project” was, until the bomb exploded over Japan. This is a wonderfully written book, with personal stories, exalting the achievements of women without touting them, and discussing the science behind the project in understandable terms. It also demonstrates how women seized opportunity when it was presented. I think Jim’s aunt would be tickled at women’s progress and would raise her martini glass in salute.